SFC (Ret.) 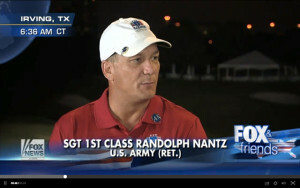 Randy Nantz enlisted in the Army because of 9/11 and after deploying overseas with the 3rd Infantry Division in 2003, he was selected as a Green Beret Communications Sergeant in 2006. On Dec. 22nd of 2006, while deployed with 5th Special Forces Group, Randy’s vehicle was hit by an EFP (a devastating roadside bomb) and he sustained traumatic injuries that resulted in 22% 3rd degree burns, large muscle tissue loss, and severe nerve damage that ultimately led to his lower left leg being amputated. Randy has always been called to serve and did not let his personal setbacks prevent him from continuing to help others in need. During his yearlong rehabilitation and recovery, Randy discovered the value in shared experiences and he became a mentor for other veterans in a similar situation. He joined the SOCOM Care Coalition in 2007 then joined GBF as Director of Programs and Services in 2012. During Randy’s four years at GBF as Director of Programs, assisted thousands of Green Berets and family members to receive the assistance and guidance they have earned. Randy identified gaps in VA care that denied Green Berets from receiving desperately needed treatment, and has been instrumental in providing dozens of Green Berets with treatments such as HBOT that has shown to be immensely effective for traumatic brain injuries and PTS; treatments they otherwise would not have received if not for GBF and Randy’s efforts. Often called GBF’s Team Sergeant because of his continued and vocal dedication to Green Berets and their families, his passion to serve the Special Forces community is open and obvious. Randy readily tells all those around him of the important mission he and GBF have undertaken as he strives on a daily basis to help his brothers and their families. As GBF’s Director of Programs, Randy was able to expand GBF’s reach. Randy identified the need for the Family Support program to assist Green Berets’ families with additional and significant expenses, such as travel and lodging. Additionally, Randy’s outreach and advocacy resulted in nearly a tripling of GBF’s scholarship resources and applicants. GBF is proud of the many young scholarship recipients pursuing their education. It is no secret that Randy has been pivotal in GBF supporting the Special Forces community while he was Director of Programs. He has recently taken a big step to pursue his education. He is now working towards finishing his Bachelor’s degree while continuing to serve as a Green Beret Foundation Ambassador. When not working and studying, you can find Randy on a golf course proving that physical limitations are only a state of mind or spending time with his two loving and beautiful children – Ashley & Joshua.